Our marvelous Rosa Italian marquetry frames are available in four photo frame sizes. The play of light and dark woods combined with intricate inlaid patterns make these frames extra rich - and great as a group. They'll look great in a family room or office. Again, as an very attractive memorial. I am pleased with the purchases. I use the frame to display favorite personal pictures. The frame has a great appearance. What bothers me is the bendable metal holders that keep the back in place. With several changes of pictures they may break. I have 2 of these 8x10 frames. They are beautiful but that's all I can say. The 8x10 size is not true. Maybe because they are Italian and were created in a metric scale, 8x10 pictures do not fit. I have to trim them slightly on both length and width each time which makes them a hassle to change. Another thing that makes them a hassle to change is that they use framing points instead of the neat little rotating pieces that some frames use. So I have to get out pliers each time. Still, I was putting up with these inconviences. But, the easle back is made of cardboard covered in felt, so after having the frames for about a year, they have slowly warped enough that pictures no longer stand up very well. I have other frames from a different source whose easle backs are wood which is much nicer and doesn't have this problem. Those frames were a fraction of the cost of these Italian ones from Exposures. Save your money. I have other sizes of this frame already. They're beautiful! Adding additional frames to a collage series of the same. Love the quality and design of these frames. 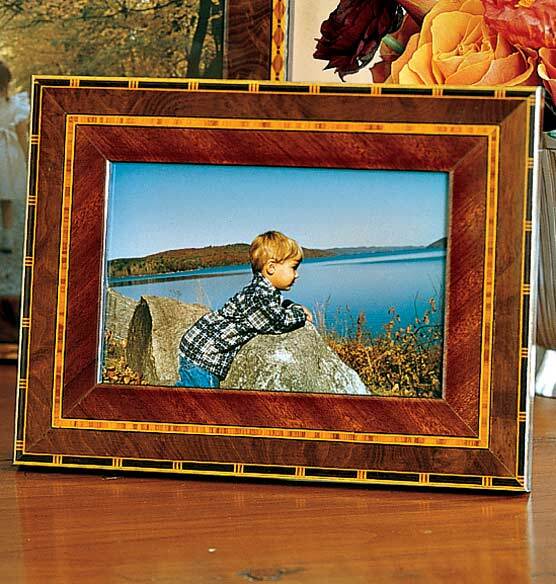 I love the look of marquetry picture frames. Beautiful craftmanship in its construction. This is a beautiful frame to house grandchildren school photos. The Italian Marquetry frames are my favorites. I favor artisans who hand produce objects. Like the subtle variation in wood color. Brings out highlights of photograph. Is similar to the one I already have. I like it! 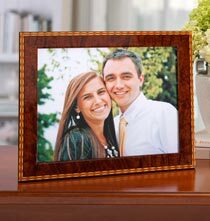 Look at this frame -- the rich colors, the exceptional grain, the natural beauty of inlaid wood. The real question is not why did I choose this frame, it is why would anyone not choose this frame. Truly exceptional. I would write more, but I need a little time to just savor my investment in quality. I think this thing is made in Italy, too. Just like all those fancy shoes and handbags, which you should probably also buy. I have bought dozens of these from Exposures over the years. As gifts, they are huge hits, assuming you've first loaded a quality photo! Very, very good quality. How can I order an 8" x 10" frame. only 3.5 x 5" showing? BEST ANSWER: Thank you for your question. Unfortunately we no longer carry the 8x10 size. We hope this information will be of help to you. how deep is the frame - the space between the back and the glass? BEST ANSWER: 1/4" from back of frame to glass. Entire width is about 1/2"